The Satir Change Model was developed by Virginia Satir, a family therapist, and author. The model was designed to help people improve the way they cope with major, unexpected change. Although the model was originally developed for family therapy, it also applies to how people cope with organizational change. Managers and leaders can use the model to understand how their teams cope with change as they undergo it. They can then use this understanding to move their teams through the change more quickly and more efficiently. The Satir Change Model, sometimes called the Satir Growth Model, is shown in the diagram below. At the heart of the Satir Change Model, is the conviction that it is always possible for things to get better. However, this takes time and things usually get worse before they get better. On the vertical axis, we have the performance of our team, increasing as we go higher. And on the horizontal axis, we have time, moving to the right. One important point to realize about the curve within the diagram is that it is deliberately not a thin line. What this means is that our team’s performance can oscillate within the bounds set by the curve. Or to put it another way, some days will be better than others for our team. As you can see from the diagram, there are five stages of the Satir Change Model. Let’s examine each of them in turn from the point of view of an individual team member. This phase describes how things are shortly before you become aware of the major and disruptive change. This phase can be characterized by the phrase, “business as usual”. Things are happening in the normal way they do every day. Each day is similar to the day before and you know what to expect. You know how to perform your role and you are comfortable performing it. Late status quo might mean that things are working reasonably well, but it doesn’t have to mean this. It simply describes the time before the major disruptive change changes everything. Some people on the team might be already looking to change how things are done. We enter the Resistance phase when something happens that shatters the comfort of the Late Status Quo. Perhaps a major event has happened, or you have become aware of some new information you didn’t previously have. This new awareness is called a foreign element. A foreign element is named as such because it comes from outside how things are currently done. A foreign element always requires a response. The foreign element may come from within, for example, where a team member wants to improve how things are done. The foreign element may also be external, for example, an organizational restructuring originating from serior management you have never met. During this phase, you try to resist the foreign element. There are many ways you might try to do this, including ignoring it or blaming others. You can read more about the different ways people try to resist change here. As an example of resistance, consider a technology organization that has hired a consultancy to examine how efficiently the team works. They do this because the team is innovating more slowly than competitors. During the course of this work, the consultancy identifies lots of potential performance improvements, but they require major changes to how the team works. These changes seem scary so the team, including its management, might try to ignore them. They might try to dismiss them by saying that they are too big, complex, and disruptive to implement. They might suggest taking on board some of the easier, less difficult changes. If the foreign element obtains critical weight, it means the change is going to happen, and the organization enters the Chaos phase. Suddenly, it is no longer business as usual, and you are in unfamiliar territory. Old ways of working no longer yield results. Old relationships break down. Old ways of doing things are no longer appropriate. Your performance drops. So does the performance of those around you undergoing the same chaos. During the chaos phase, you feel stressed, confused, vulnerable, afraid, and even sometimes a sense of panicked urgency. Because of these feelings you may retreat into familiar mundane tasks, ignore the chaos around you, withdraw completely, or exhibit unusual behavior. The feeling of panicked urgency may cause you to seek quick sweeping solutions. For example, the threat of an organizational change may have you thinking about giving up everything, moving to Bali, and becoming a yoga instructor! This happens because you are desperate to find a solution to the chaos. Counterintuitively, this desperation can lead to the chaos period being somewhat creative. Managers responsible for teams should plan for their team’s productivity to decline dramatically during this period. Managers should help team members acknowledge their feelings and reach out to their support networks. They should also help them to understand that these feelings are normal and that there is no quick-fix magical solution. During the Chaos phase, you create lots of ideas. Eventually, one of these ideas will be a Transforming Idea. A transforming idea is one that helps you to make sense of the foreign element, or a least enables you to cope with the foreign element. A transforming idea gives you a way out of the chaos. It makes it possible to see what it is that you need to do to move forward. The key to this phase is to be able to see how the foreign element can benefit you via a transforming idea. The transforming idea makes you excited. You start trying out your new ways of working, and you may form new relationships. Your performance improves dramatically as you acquire new skills and rapidly improve them. As an example of a transforming idea, let’s return to our efficiency improvement example. You fear the new ways of working, especially working with new computer software. Eventually, you form the transforming idea that being able to use this new software will make you more marketable and should result in higher remuneration. Suddenly, you can see the benefit of changing because you’ll earn more. Managers need to understand that their team members need a lot of support during this phase. Employees can become frustrated and revert to the Chaos phase if things don’t go that well first time or they appear more difficult than they first thought. In this phase, your new ways of working become embedded. What was once a new skill becomes second nature. As part of this, new assumptions are formed. 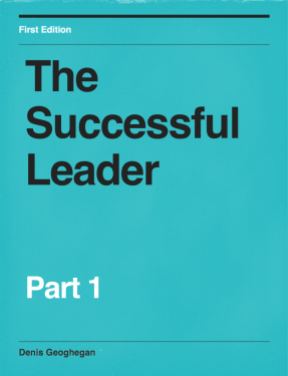 Your performance begins to level off as you master your new skills and a new status quo forms. What were previously new ways of working become your new norm, and a new status quo is established. Managers need to encourage employees to celebrate their successes during this phase. They also need to encourage employees to remain receptive to new ideas and ways of working to further enhance performance. The Satir Change Model describes how an individual moves from the Late Status Quo to the New Status Quo when they experience a major unexpected change. As a manager, you can use your knowledge of this model to offer the right support to your team at the right time. This will allow the change to proceed as quickly and efficiently as possible. The following table shows how to help your team through each phase of a change. Encourage people to seek to improve how they do things. Encourage people to remain receptive to improvement ideas. Ask team members to look externally for improved ways of doing things. Encourage people to open up and express their feelings. Encourage people to talk to others, especially those that are more positive about the change. Help build a safe environment for people to express how they feel. Encourage people to reach out to their support networks. Encourage team members to chat through their new ideas. Work through magical solutions with your team and help them to conclude that these are not usually the answer. Encourage your team to explore and try out new ideas and ways of working. Ensure your team members understand that it’s okay to fail or find things difficult at this stage. Encourage team members to discuss new ways of working and possibilities with others. Promote a safe environment so people feel free to practice and fail. Encourage your team to look for areas which could benefit from incremental improvement. 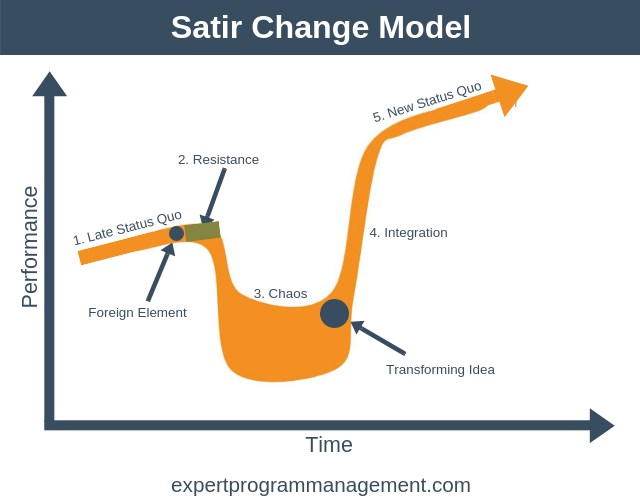 Although the Satir Change Model was originally developed to help people through dramatic personal change, it can also be used for organizational change. By using the model managers can help their teams overcome the challenges associated with major change as quickly as is possible.